Last month, Hotel Designs lit up the conversation around in-hotel technology and where trends are heading in the near future of hotel design. One conversation that came up time and time again was the idea of designers using lighting in more savvy ways to create a certain ambiance. With this in mind, I decided to ask the experts at Hamilton Litestat who are ahead of the curve and in-the-know when it comes to the future of lighting technology in the guestroom and beyond. Hamish Kilburn: How has lighting recently become more of a focus in guestroom design? Gavin Williams: Lighting has always played a significant role in the guest experience of a hotel. First impressions count and from the moment a guest sees the hotel building and walks into reception, lighting is being used to create a statement about the hotel. Within a hotel’s guestrooms, lighting control provides important functionality. In the week, many guests are business people who need to use their rooms as a place of work during the day. Then, in the evenings – as well as weekend guests – they want to use the space to relax. Lighting control transforms these spaces between the different functional requirements, easing from bright work-appropriate lighting into softer mood lighting at the touch of a button or swipe of a finger. This also applies to the function rooms, restaurants and bars within a hotel. The atmosphere – and therefore the lighting requirements – for breakfast is very different to an evening meal setting, so lighting control can support this space transformation too. HK: I think a lot of designers shudder at the thought of lighting control in the guestroom. Can you put their minds at ease by telling us what makes Hamilton’s products user friendly? GW: Lighting control certainly doesn’t need to be complicated. From a designer’s perspective, all they need to do is tell Hamilton what effects they want to achieve, and our team will deliver a pre-programmed system to suit. Designers don’t need to know the ins and outs of how the system works, that’s Hamilton’s job! We take the brief and turn it into the desired solution with no headaches. Our solutions offer a range of effects, so designers should consider the result they’re after and whether they’d like dimming control, the ability to mix light and colour with DMX options, or the ability to set scenes. If they’re unsure, they can visit Hamilton’s showrooms in Bristol or at the Mere facilities to talk through the options and see demonstrations so they have the confidence that the system will deliver their lighting ideas. And, even more importantly, our smart lighting control solutions make things simple for guests too. They can be controlled by simple yet elegant button switches that are available in a range of designs, easy-to-use glass control panels or via an accessible app on a smart device. 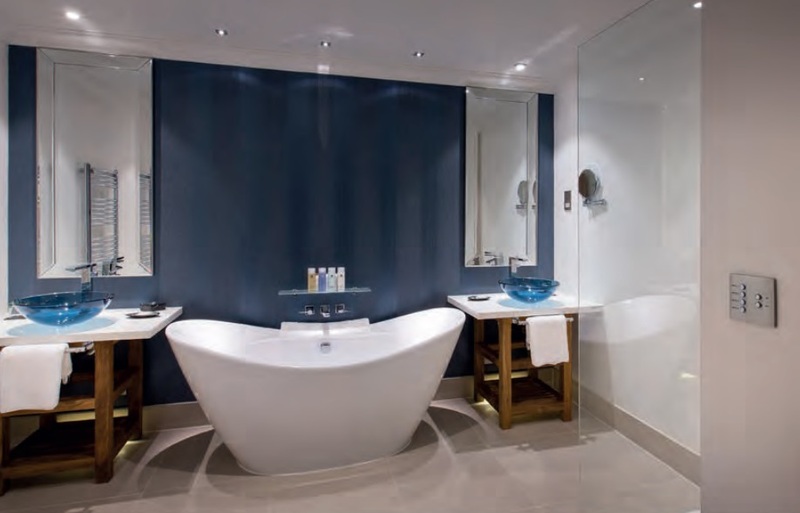 HK: Do you keep track of trends, and what lighting products are most popular for hotels? GW: Yes, we make sure we take notice of the lighting trends within the hotel sector, and the general design trends. Both are very important to our business. 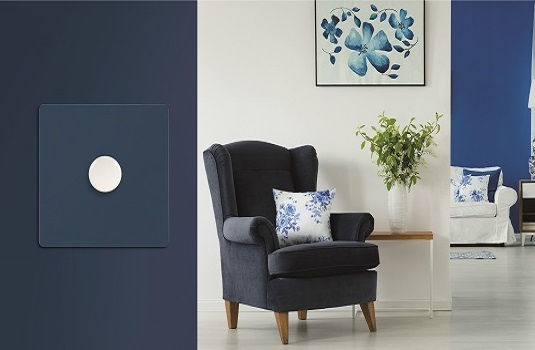 Our smart lighting control solutions can help achieve these looks, but as we also design and manufacture decorative wiring accessories, we offer switched plates and sockets with the latest on-trend finishes. We’ve found exhibitions such as Decorex, The Independent Hotel Show and the recently rebranded SLEEP+EAT particularly helpful for keeping abreast of the latest trends. We exhibit at these shows and have both hoteliers and designers visit our stand, so we often find ourselves discussing current trends and themes that require lighting control. We also participate in the Hotel Designs networking events, which we find very useful. Hamilton’s solution is very flexible and can be programmed to deliver more complex solutions as and when new trends and requirements come in, but we’re also always happy to build a bespoke system to meet a specific design brief. HK: Can you explain the creative elements with regards to what goes into designing a new product? GW: Products are bought, not sold, so new product development must be driven by talking to customers and uncovering what is missing from the current market offering, or what is not working with existing products on the shelves. In terms of the crucial elements when designing a new product, function and form has always been important to Hamilton and balancing these two elements is something we pride ourselves on. We ensure our products deliver smooth, seamless and effective functionality in a product that’s attractive and well-designed. In a hotel, the bulk of any lighting control system will be installed out of view in the hotel’s hub room. It’s only the control plates that are visible in guestrooms so, typically, a designer wants to create a special control plate, one that has a unique shape or finish to coordinate with other wiring accessories in the design scheme. 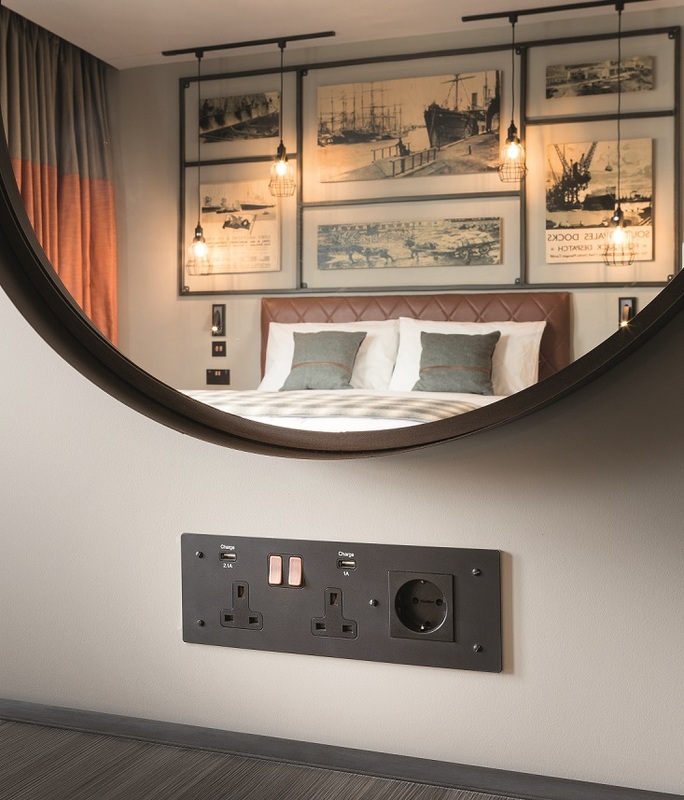 As pioneers in the manufacture of decorative plates for switches, sockets and lighting controls, Hamilton has accrued 50 years’ experience in meeting the specifications of designers and hoteliers. We simply need some guidance on the function, style and finish that’s being sought, and we will interpret these wishes to provide a suitable solution. The Hamilton design team can offer 3D CAD drawings so that customers can view product designs from different angles and perspectives to ensure it meets the most exacting requirements. This also shortens the lead time from design to product sampling. We’re also happy to create highly finished sample prototypes for a designer to present to their client to help them buy into their design ideas. HK: How are Hamilton Litestat products made? GW: The majority of Hamilton’s products are manufactured in our factory in Bristol: we’re a family-run business producing British-quality solutions. Our production facility includes complete CNC, Laser and Water Jet Cutting capability. In addition to our standard selection of finishes, we can provide bespoke premium finishes, including PVD, in a choice of finishes such as Nickel or Antique Gold. If required, we can print text or graphics on plates by Laser Etch, Pad Printing or Engraving. In short, it’s a mixture and both machine and hand finishing to ensure our customers get a quality product both in terms of design and manufacture. 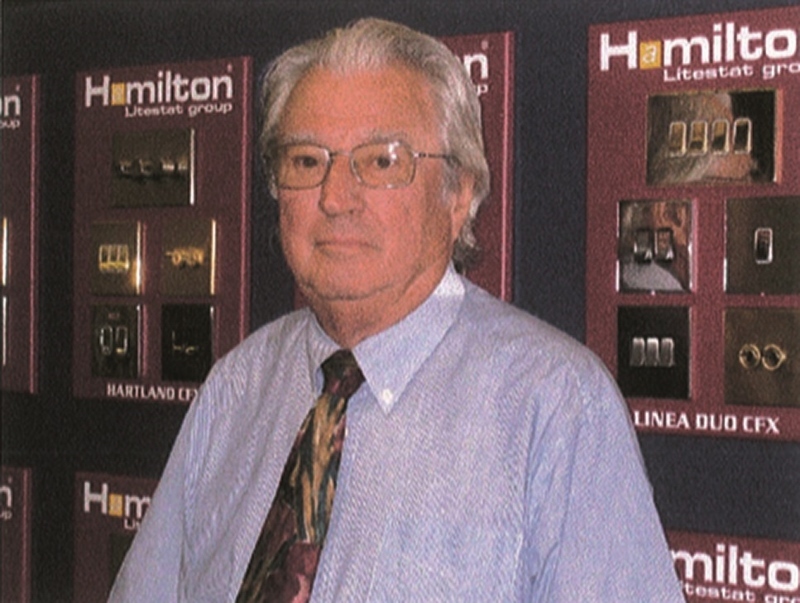 Hamilton Litestat are one of our recommended suppliers. To keep up to date with their news, click here. And, if you are interested in becoming one of our recommended suppliers, click here. Known as a tough businessman with native acumen, he, nevertheless, was also gregarious and generous, hospitable and humorous. One hell of a character, whose passing leaves a big gap in hotel design. 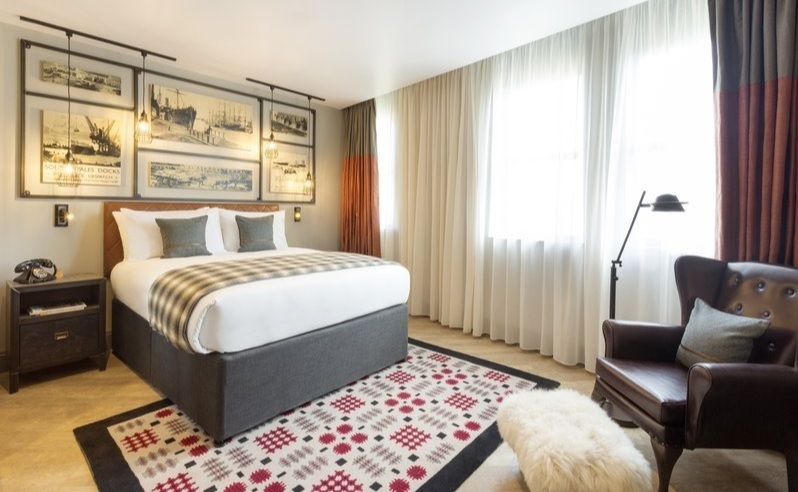 Hotel Indigo Cardiff is a boutique hotel that has been designed by Matthews Mee Interior Design to evoke classic Welsh heritage. 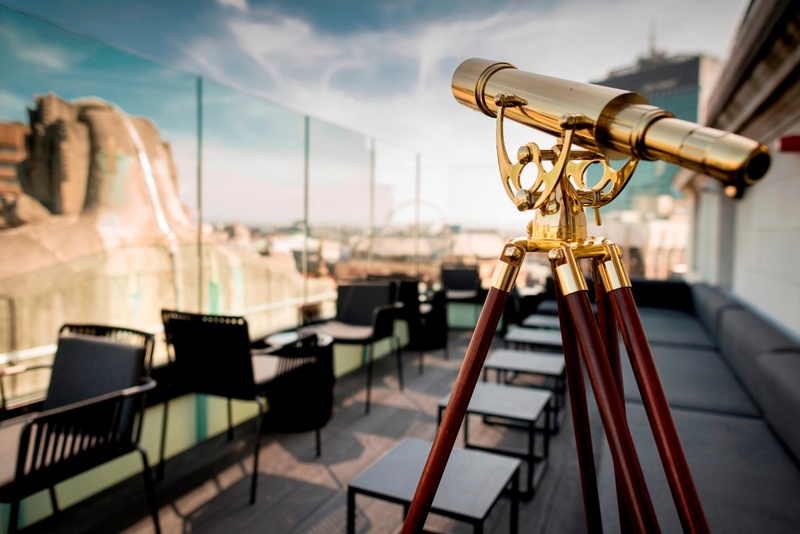 As with all Hotel Indigo establishments, the surrounding area was carefully researched to discover the location’s intricacies, its history, special events, industry and people. The hotel is then designed around this to provide a unique and more meaningful experience that reflects the hotel’s location. Working with contractor Kier and local wholesaler Evans Electrical, Hamilton Litestat was chosen as a solutions provider. 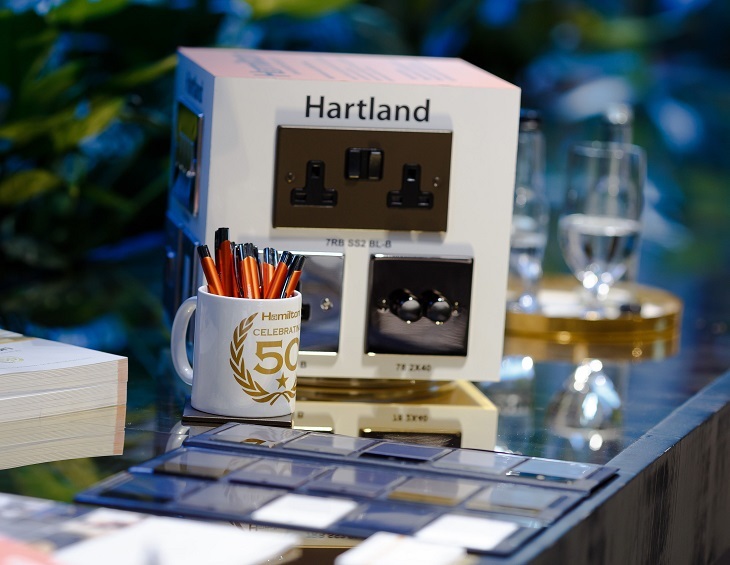 Hamilton’s sleek and stylish Hartland collection of box-fix decorative wiring accessories was nominated as the perfect match for the interior design theme. With a vast number of rooms to furnish, a combination of Hartland 1, 2 and 3-gang rocker switches were specified for controlling lighting in each room. 2-gang dual-switched sockets were selected for power supply while further dual-switched sockets equipped with two USB charger points were also fitted at bedsides for easy access. One USB port is 1A rated for mobile phone charging and a second 2.1A USB port is for charging tablets and other devices. 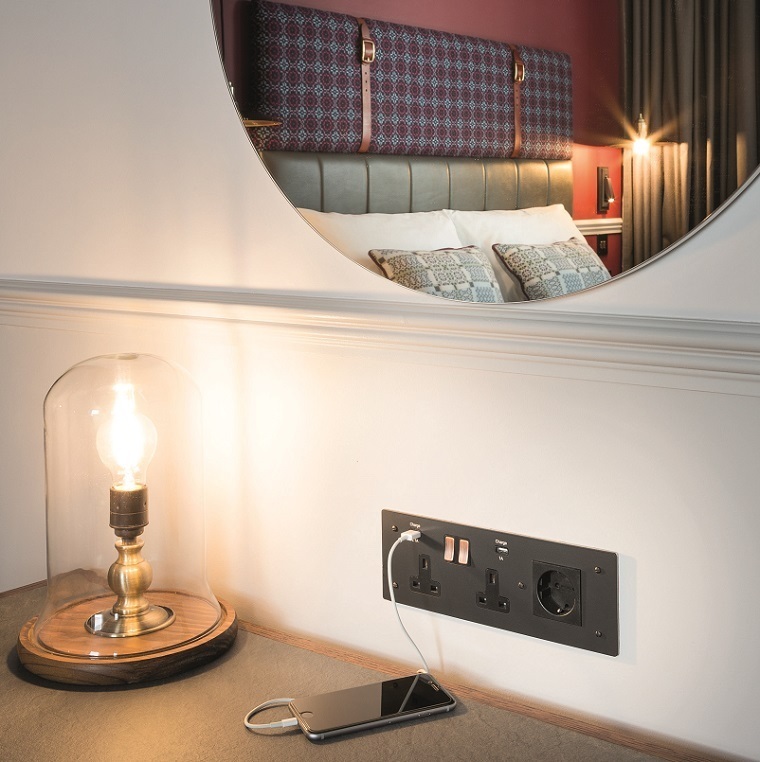 With USB charging capabilities, the Hamilton switched sockets meet the demands of modern hotel guests who want to be connected 24/7 using their smart devices. 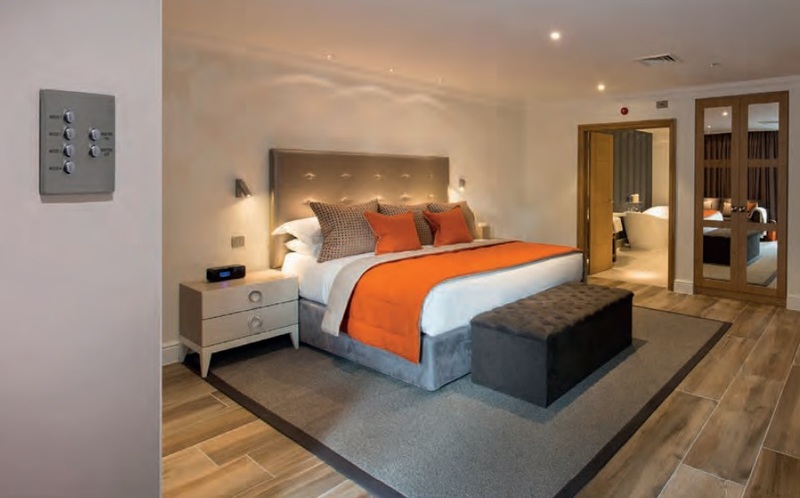 Hotel Indigo Cardiff is due to start taking guest bookings in November with much anticipation building for the opening of this stunning hotel. 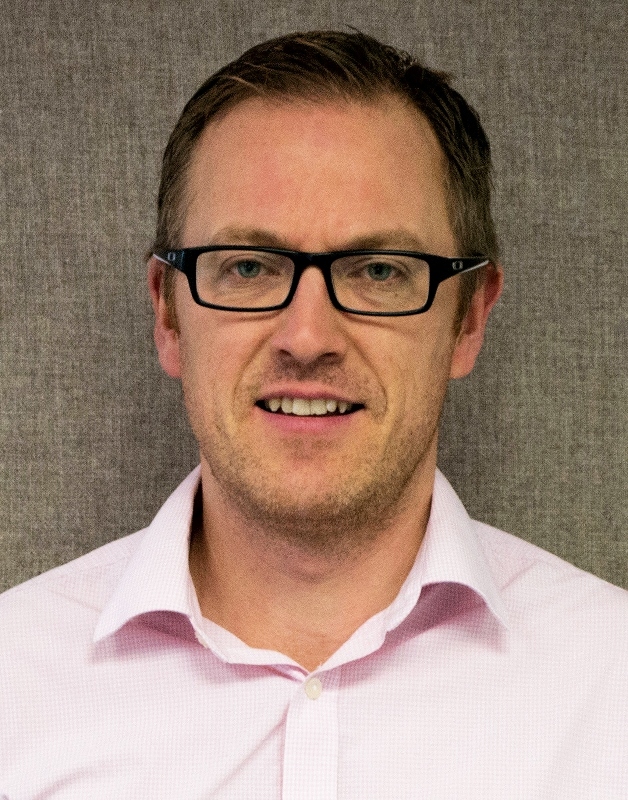 Andrew Miles, senior project manager, Kier Construction Western and Wales, said: “Kier is pleased to be long-standing customers of Hamilton. We have always been impressed by the company’s quality solutions and customer service. Following a successful show last year, Hamilton is again returning to interior design exhibition Decorex on 17-20 September 2017, held at Syon Park, London. At the event, Hamilton will launch their popular Hartland CFX® and Sheer CFX® ranges in a new primed finish that can be painted to match any interior colour or theme, making customisation even more accessible. The new primed finish plates will be displayed on Stand H37a at the show, which is a key event for interior designers. As well as the sleek and modern Hartland CFX® and Sheer CFX® ranges, the primed finish option is also available on any bespoke plates so they can be painted to match a wall colour, wallpaper or soft furnishings. The primed plates come with a choice of insert finishes, from Bright Chrome to Antique Brass, and with either black or white inset surrounds. Decorex takes place ahead of Hamilton’s 50th anniversary celebrations in 2018. 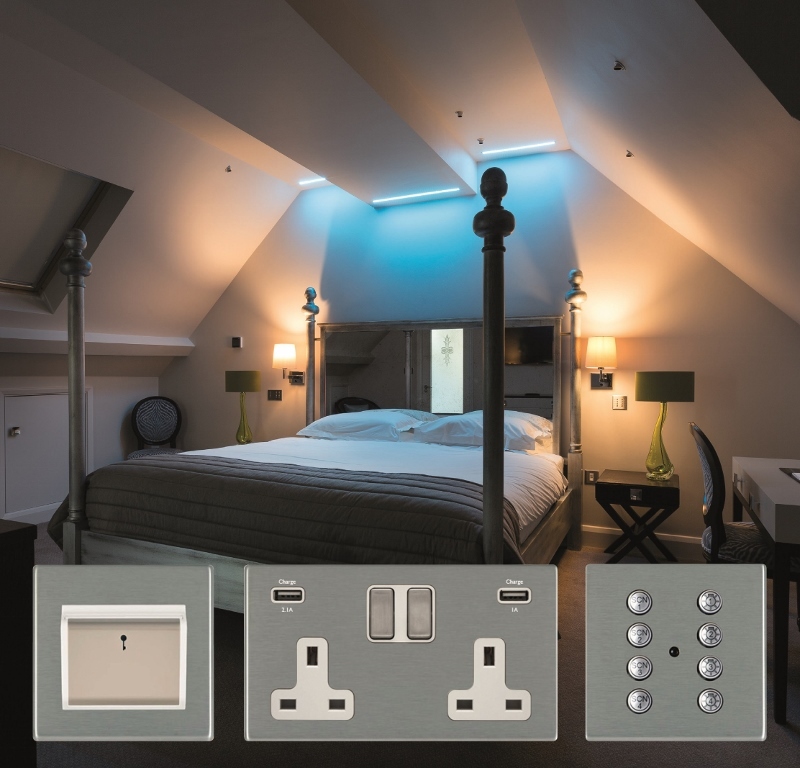 During the past five decades, the family-run British business has become renowned for supplying high quality decorative electrical wiring accessories, lighting control and multi-room audio systems that are manufactured and finished to an exceptional standard. They will have a plethora of product on show that have been designed to create the right look and ambience in any space, while meeting the exacting project demands of architects, interior designers and tech-savvy homeowners. Amongst the solutions on show will be their increasingly popular range of USB switched sockets. 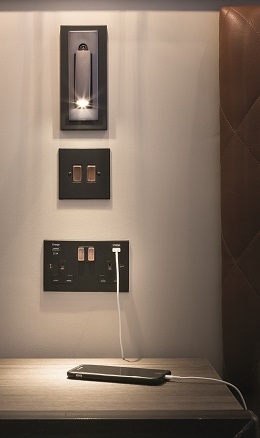 Available in Hartland, Hartland CFX®, Sheer and Sheer CFX® designs, these USB sockets ensure the latest smart devices can be easily charged through a USB port, fulfilling the need to be connected 24/7. Unlike some of Hamilton’s competitors, its dual USB switched sockets have a 1A rated USB port for charging mobile phones and a second 2.1A USB port for tablets and other devices, meaning double the charging capacity simultaneously. Hamilton will also showcase its Smart Lighting Control, including its RGB DMX control option. This allows a colour wash to be applied to an area using LED lighting, helping to add drama, create a certain ambience or to ‘zone’ specific areas of a larger space. Typically popular in the bars, hotels and restaurants, this on-trend lighting solution is becoming more desirable domestically and is adding flair to homes and hotels. Don’t forget to pick up your free designers’ swatches on Stand H37a, a great reference tool illustrating available plate finishes. Divided into two tone boxes, the ‘Warm’ collection includes Polished Brass, Richmond Bronze and Connaught finishes, amongst others, while the ‘Cool’ collection includes Bright Stainless, Black Nickel and Satin Chrome. 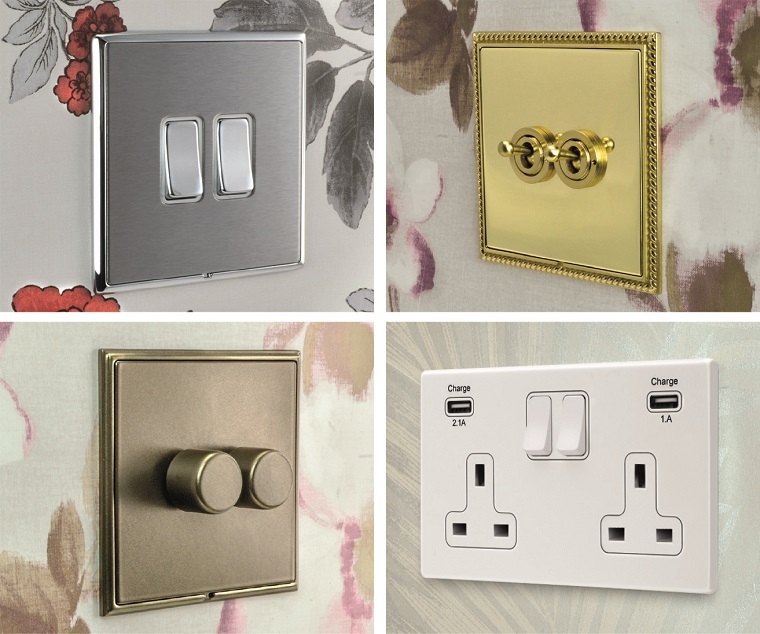 The finishes can be applied to Hamilton’s enormous collection of switch and socket plate designs. However, if you can’t find exactly the right solution for you, the Hamilton team will be on-hand to discuss their bespoke design and finishing service. The team can create an electrical wiring accessory that’s as unique as your design theme or has the exact functionality that you need. This is particularly helpful for those working on hotel projects where bespoke multi-function plates are needed. To find out more and speak to one of the Hamilton team, head to Stand H37a at Decorex. Exhibiting at the Independent Hotel Show for the first time, British electricals designer and manufacturer Hamilton Litestat will be demonstrating its vast range of luxury products and new technologies to enhance the hotel guest experience at the must-attend show, held on 18-19 October 2016 at Olympia West in London. In such a fast-paced culture, consumers are continually seeking innovative technologies and the highest levels in comfort and style: it can be extremely difficult and costly for independent hoteliers to keep up with the latest demands. Hamilton will showcase its cutting-edge technologies and chic products that deliver the latest functionality cost effectively for the boutique and independent hotel sector. Smart controls deliver huge experiential impact but can actually save a hotelier money. Get inspired by the Hamilton’s Mercury Lighting Control system at the Independent Hotel Show. The Mercury system can be used to deliver appropriate mood lighting schemes at the flick of a switch or touch of a button while also achieving significant cost and energy savings of up to 80%. 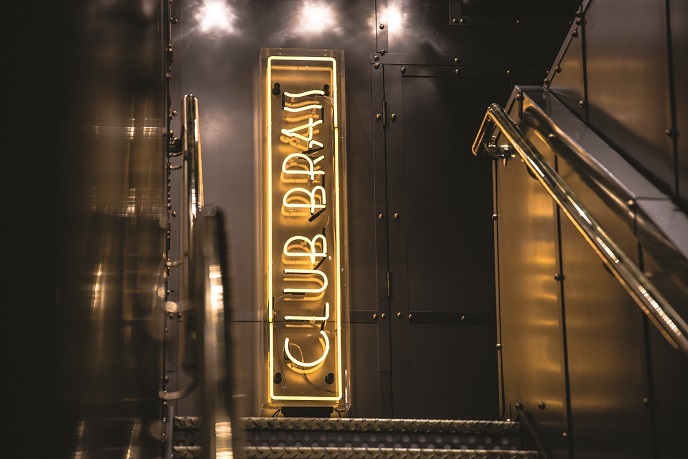 The latest development in lighting control is the RGB DMX option, where a colour-wash can be used as accent lighting to add drama to a space. – ideal for use in guest rooms, bars and restaurants. 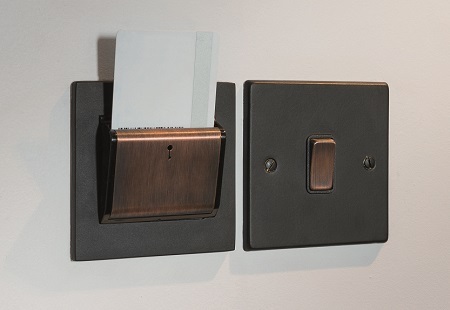 Matching control plates are available from the Hamilton collections for that totally coordinated look. Also on show is Hamilton’s Mercury Multi-Room Audio System, which allows guests to listen to their own music effortlessly via USB and/or Bluetooth connections throughout their suite. Audio can be isolated to one area or can be played through all of the room’s speakers, again at the touch of a button. 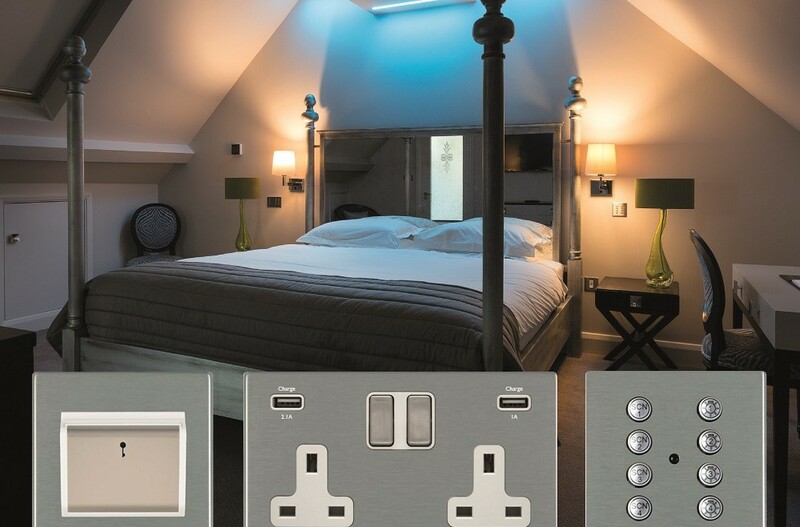 Both the lighting and audio systems can be controlled via Hamilton’s vast portfolio of switch plates and ‘key card switch’ systems, which can be effortlessly programmed to activate specific pre-set lighting scenes as well as control other room functions such as air conditioning, blinds and entertainment centres. Hamilton’s coordinating socket plates will also be on show, including the latest USB charging options and international sockets. There’s a design and finish to suit every taste, with a special bespoke service available to create a solution that’s tailor-made to your exact requirements. Visit Hamilton on Stand 261 at the Independent Hotel Show to get inspiration and see how the latest products and technologies can enhance your guest experience. Hamilton Litestat is confirmed as one of just eight exhibitors to showcase its product range at the annual conference for the British Institute of Interior Design (BIID). Set to explore the theme of ‘interior identities’ this year, the BIID Conference will take place on 16th June 2016 at Royal Geographical Society in London. British designer and manufacturer Hamilton Litestat will display its high quality decorative electrical wiring accessories, lighting control and multi-room audio systems at the event. 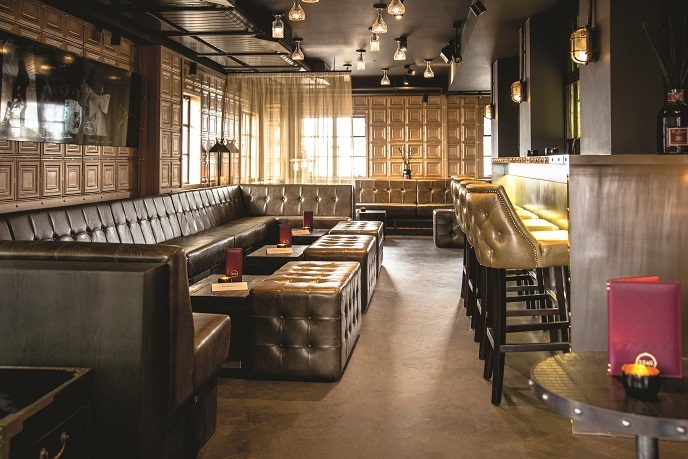 With its design-led collection of products created to meet the exacting project demands of architects, interior designers and interior specifiers, Hamilton is a trusted partner and solutions provider to the sector. 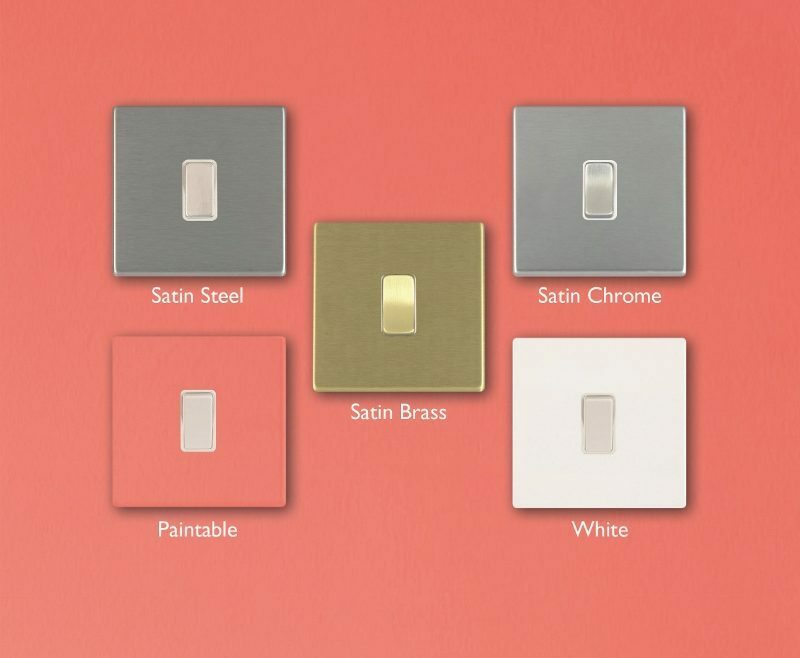 Hamilton Litestat will showcase its portfolio of 18 designer switch plate and socket collections that span current trends and classic designs. Manufactured in metal, plastic, wood and glass, the collections are available in a variety of finishes, including four new shades of bronze. 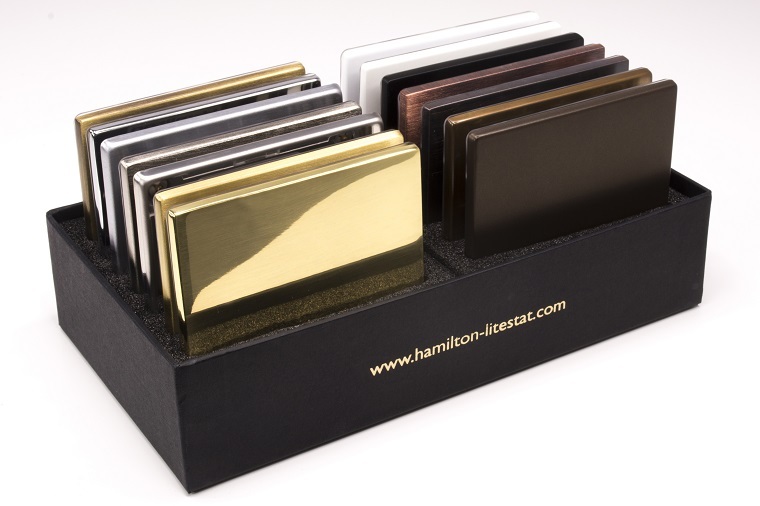 Its in-house design and manufacturing service allows Hamilton Litestat to also produce bespoke non-standard size plates in a special finish or colour to meet the requirements of any design project. One-of-a-kind electrical accessory solutions are created, with highly finished prototypes provided as standard to ensure the bespoke solution is exactly right for the interior environment.